Club Penguin Cheats by Mimo777 Club Penguin Cheats by Mimo777: Dot Trusts Herbert! Dot has sent us a Club Penguin message! She wants Herbert to help us against Protobot. 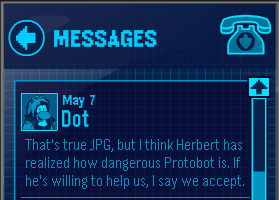 Well, if Dot thinks we should trust Herbert, what do you think? Yo mimo, if you click on the newspaper on cp, it doesn't bring it up. Your penguin holds a newspaper but YOU can't read it. Well JPG is right but Dot is right! ITS CONFUSING! Not in a million years id trust him! dot's crazy! I'm with JPG. I dont think we can trust herbert again because remember when he tried to destroy the island and said that he will do it again sometime for his paradise. Dot needs to think this over again. Heh, how dumb would they have to be to trust him?!? I think Protobot gets to frustraiting. Thts y hebrt wants to join us! Herbert's our enemy! We can't trust him! we cant trust herbert because in the may parent update it says we need to throw lots of snowballs to defeat HIM! Of course you should trust me you... you... Excellent Pleasant Friends. This terrible face I'm making right now? Oh that's what I do when I like someone! Sure... Let's go with that! Trust me penguins, Trust me. Like, seriously. Is Dot crazy or something?? How could you trust a polar bear who blasted the PSA with popcorn, attempting to burn down the ski lodge, and swore revenge everytime we defeated him?? I'm with JPG too, he's normally right, right? Why can't we just capture him? My friend saw you on cp, Jammer DJ. Man... how i wish i could meet you. Haha! :) Peace out Mimo cya! I have a question: WHY does the Protobot want to destroy the EPF? All he cares about is upgrades. Did Herbert reprogram him? Hmmm,Thats Some Problem!We Dont Trust You Herbet.P.Bear! Agents,Soon Special Helper Agents Will Get An Rarest Secret Gear!Get Ready For An Battle With Herbet! P.S I visit your cheats everyday,even in 2010! i will not bunn u ! BZZZK!Systems online.Thought you're so clever trying to stop me Herbert?Well I have a little suprize for you!Actually,I created a new bot called Disguise bot!Now,I will destroy you puny agents!Good luck getting out of this situation!